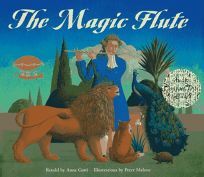 Mozart's most child-friendly opera receives the royal treatment in this elegant yet highly approachable picture book. Accompanied by the sweet strains of musical highlights (if readers wish, they can play the audio CD that is included with the book), Gatti's (Tales from the African Plains) lucid retelling beguiles young readers with the story of prince Tamino and his feathered sidekick, Papageno, who battle the forces of evil to save their respective true loves, Pamina and Papagena. There's plenty of bewitching material here, from monsters and the evil Queen of the Night, to an enchanted flying machine and the birdman Papageno's comic shenanigans; and the tale's heroics (Tamino's three trials of fire and water) are fine fodder for capturing young imaginations. The book works equally well as a stand-alone or when integrated with the audio experience (each spread is keyed to a corresponding musical selection). Malone's (The Secret Language of Dreams) luxurious paintings unfold as a series of courtly tableaux, with characters dressed in formal 18th-century costume, and there are numerous hints of the theatrical setting. Endpapers display floorboards and a backdrop, and many scenes appear to be lit as if by footlights. Beautifully executed from start to finish, the entire concept is as much a treat for the ear as it is for the eye, and succeeds admirably in promoting the glories of this magical opera. Ages 8-up. (Nov.) FYI: The 59-minute CD of musical highlights is conducted by Bernard Haitink and performed by the Bavarian Radio Symphony Orchestra and Chorus.